Mushkin is well known for their high-performance RAM, especially from the DDR2 days. It is lesser known that their products are still assembled in the United States, and that they have American customer support. Today, we’re not looking at their RAM though, because they have stepped into the world of SSDs. 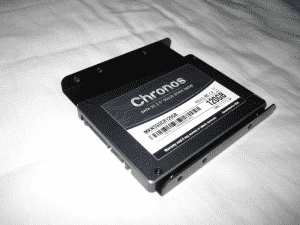 Their Chronos SSD is based off of the widely used SandForce 2281 controller. Who wants to see how it trades punches with the top dogs? Listed below are the basic specifications gathered from the Mushkin website. These specifications, except capacity, only apply to the 120 GB model. This is the lowest performing model offered by Mushkin, and also the least expensive. The other two models are the Chronos Deluxe and Chronos MX. next-generation SSD responsiveness by utilizing asynchronous NAND Flash technology. Say goodbye to rotational hard drive sluggishness by adding a Chronos SSD to your system today! Notice that they have used MLC asynchronous NAND Flash memory for this SSD. As the drive becomes more and more filled with data, it will slow down some from the published speeds. Giga is a prefix for billion or 10^9. That means one Gigabyte is 1,000,000,000 bytes. Gibi, on the other hand, is a prefix for 1024^3, or 2^30. Do the math and one Gibibyte works out to be 1,073,741,824 bytes. The confusing part here is that Windows uses Gibibytes for capacities but with the GB abbreviation. (As an aside, Microsoft and others have used “GB” for 2^30 some time, and “Gibibytes” and the other binary SI prefixes only came into being in 1998.) That’s why we often say Gigabytes although we really mean Gibibytes. Under Windows, a 128GB SSD is actually shown as a 119GB drive, although in reality it’s 119GiB. When I received the shipment from Newegg, it was simply the retail packaging stuck in a padded envelope. Everything came to me undamaged, and in a very timely manner. 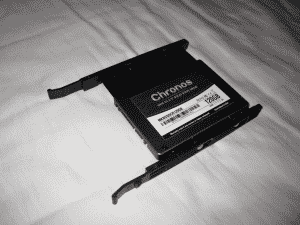 Included with the drive is a 2.5″ to 3.5″ drive bay adapter, and screws to mount the drive. There was also a small card with all of their customer service information on it. All the contents are secured inside a plastic tray, with the drive showing through the hole in the box. Taking a look at the drive by itself, it is very plain. There is a simple sticker with basic information about the drive, a statement about voiding the warranty if you tamper with the drive, and the assembly location. 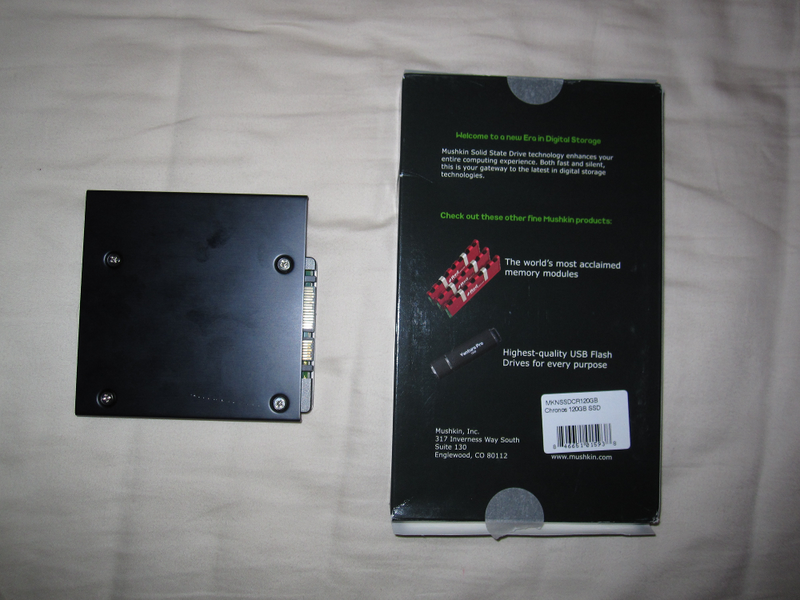 Given the drive is dark grey with only a small green stripe on the sticker, and the adapter is black, this SSD can go in a case with any color scheme (even if your case has a window) and not stick out. Personally I go for a black case with everything blacked out that can be, and white LEDs on my fans, so this SSD just disappears inside. This is the point that I would normally display the rear of the drive. However, I seem to have installed the screws mounting it to the adapter plate too tightly, and cannot remove them without them stripping. There is nothing out of the ordinary anyway, it’s is your typical setup for a SATA drive. I will first note this drive seems to be limited by my other hardware at times, as certain tests would ramp up and flat-line like the drive had more speed to push. 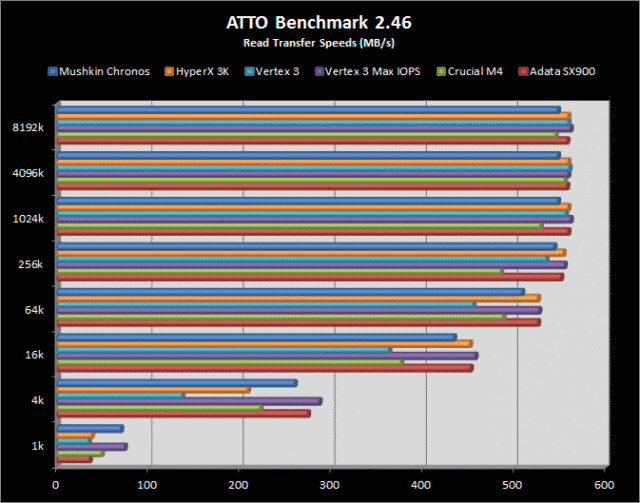 ATTO is used by most manufacturers as a basis for their advertised speeds. Mushkin specifies that ATTO was used to obtain their published Read and Write times. The first graph shows this drive kept up with the competition at every step during the read test. The read speeds peaked at 547MB/s, right at the published speed. 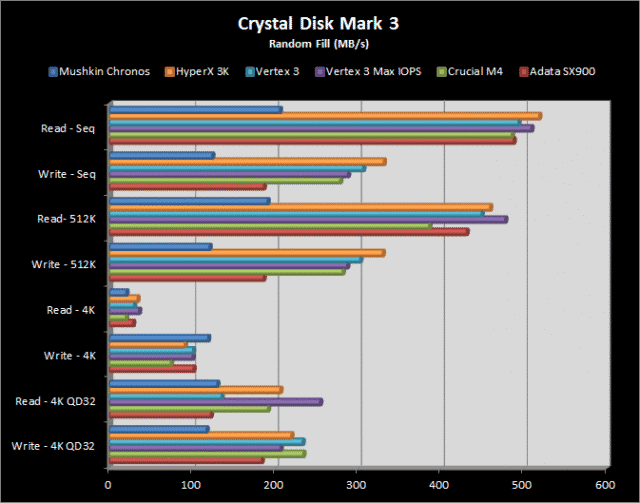 Every read test, with the exception of the 4K read, the Chronos was within 15MB/s of the Vertex 3 Max IOPS. The second graph shows the write speeds, where this drive fell a bit short of my expectations. Although this test only hit 480MB/s on the write, which is 35MB/s short of the published speed, I believe this is where the first bottleneck occurred. 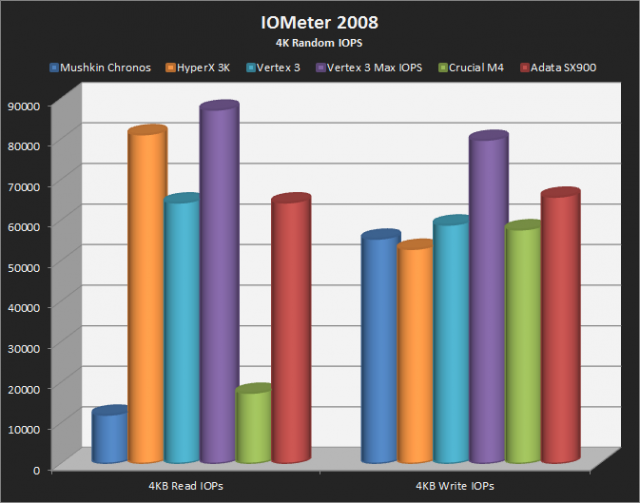 That being said, the 1k write was only bested by the Vertex 3 Max IOPS, with the Chronos leading the 4k write test! The overall results of CrystalDiskMark 3 are very back-and-forth with this drive. On the Random Fill portion of this test, it fell short of my expectations in all but 4k Write. In this single test, it won by a large margin. This also made me wonder about the rest of my hardware, because other results I have seen show that the drive manages ~480MB/s Sequential Read, ~170MB/s Sequential Write, ~420MB/s 512K Read, ~165MB/s 512K Write, and ~160MB/s 4KQD32 Write. Those numbers would put this drive right on par with the rest of the SSDs on the table today. Moving to the 0 Fill (writes/reads the drive with “0’s”), the drive performed much better, constantly nipping at the heels of the big name SSDs. Once again, the 4k Write was a clear win for the Chronos. Finally, the 1 Fill (writes/reads the drive with “1’s”). This test had the same story as the 0 Fill; close on everything and leading in 4k Write. One test in the 1Fill stood out to me in particular, the 512K Write. 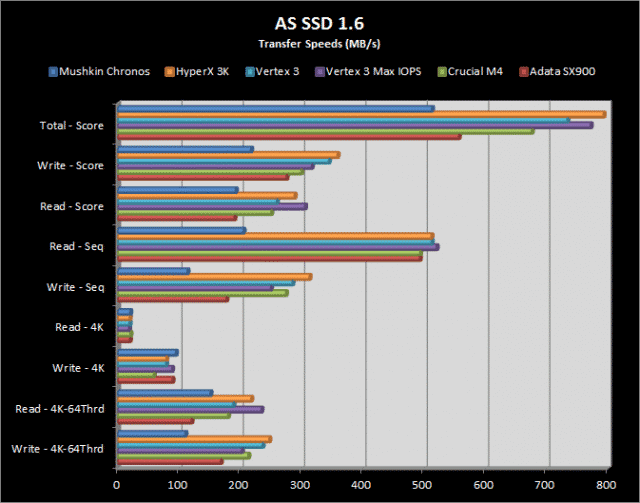 The Adata SX900 and HyperX 3K had a vast advantage over the Vertex 3, Vertex 3 Max IOPS, and Crucial M4. Surprisingly, the Chronos wasn’t “with” a group. It landed right in the middle of the pile. During the AS SSD test, I seemed to hit another bottleneck with the Sequential Read, Sequential Write and the 4K-64Thrd Write tests. These tests being lower than they should, dropped the three scores down below the rest of the drives. Other than the tests I just mentioned, this drive kept up with (and in 4k Write, exceeded) the competition. The Write Access Time was right on par with the other drives, but the Read Access Time is a bit high (.209ms). That being said, my 7200 RPM SATA III HDD has a read access time of 15.5ms. The results from IOMeter looked very good. Both Transfer Speeds and IOPS were in the middle of, or right behind, every drive listed on all the tests except one. The 4k Read on the Chronos for this test just can’t keep up, even though the previous tests looked great. 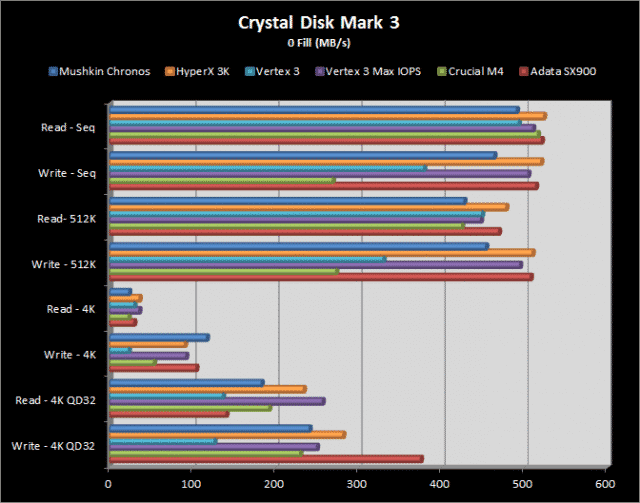 Looking at the 4K Write, the Chronos beat out both the HyperX 3K and the Adata SX900, but it was behind the other three drives. This is a surprise, given that the 4K Write on every other test was a win for this drive. The other five drives led the Chronos in the 2MB Read, but still not a bad speed by any means. And finally the 2MB Write was right where it should be, keeping up with the three leaders and leaving two drives in the dust. As for IOPS, the 4KB Read looked just as bad as the transfer rate. Dead last, and not by a small margin. 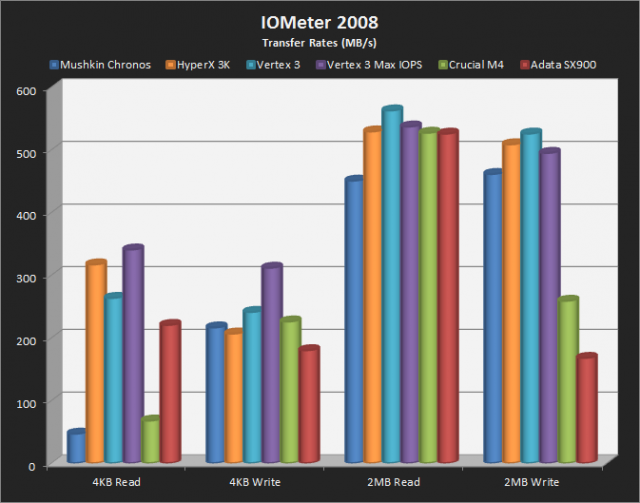 The 4KB Write was much better though, beating out one competitor and sitting on the same level with two other drives. 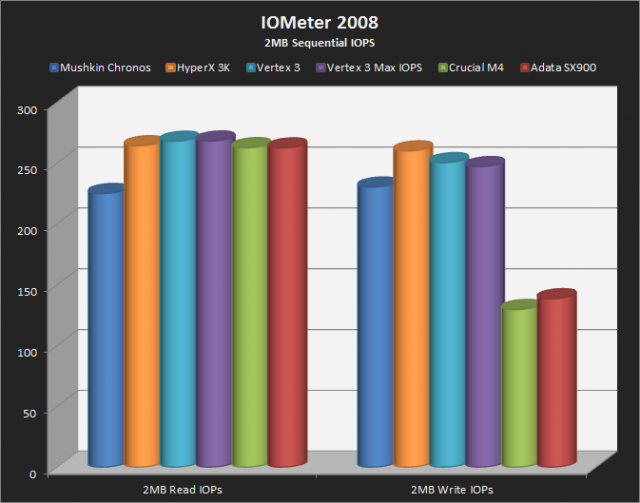 The 2MB IOPS had the same results as the 2MB transfer speeds, with the Chronos falling in just behind the top scores. IOMeter fills the drive with a certain amount of data, meaning that the drive is storing more data than just the OS during this test. Since Asynchronous NAND Flash Memory slows down as it fills up, this could explain why the 4KB read numbers fell to the floor. 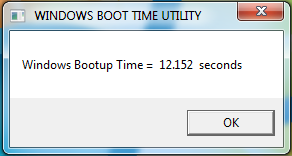 The benchmarking image of Windows 7 that I was using booted in 12.15 seconds. The image includes all of my benching software and a full complement of drivers, totaling to just over 27GB of “stuff”. Starting up in that amount of time will make any computer feel fast. At first glance, this is just another SandForce 2281 SSD. While the asynchronous NAND actually makes this drive a different class from every other drive here. The HyperX, SX900, M4, and Vertex 3 use Synchronous NAND, with the Vertex 3 Max IOPS using Toggle NAND (Like the Chronos Deluxe has). All these drives use the same controller, with the exception of the M4 with its Marvell controller. For this drive to keep up on most tests, with a lower cost style of NAND Flash memory, is fairly impressive. It runs at the speeds Mushkin says it will, if your system will let it, without stability issues. This is actually a drive that I purchased two months ago, just for my OS and games to go on. I have had no issues what-so-ever with it. Looking over the whole picture, this is one fast drive. 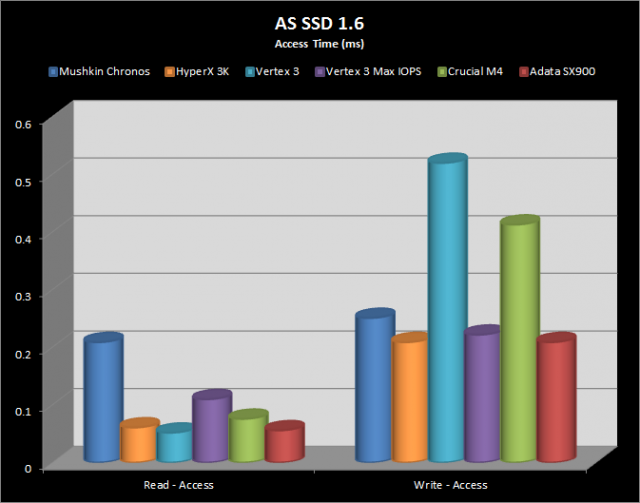 Bottlenecks aside, it keeps up with some of the big names in the SSD industry on almost every test. 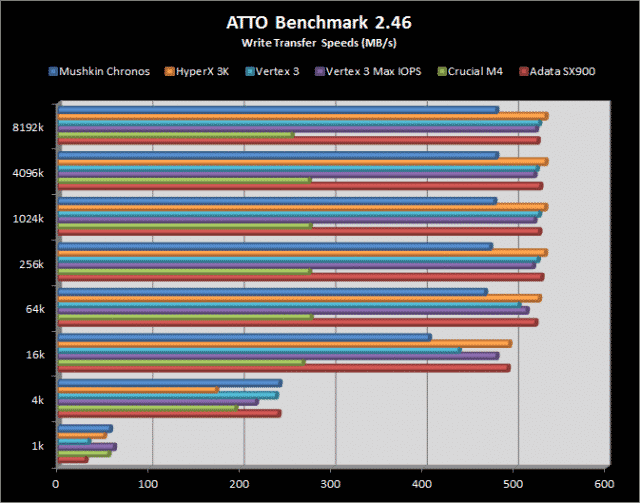 The Chronos really shined during the 4K Write tests, where it was consistently a leader. The best part about it, Mushkin made it affordable through the use of the asynchronous NAND. Today on Newegg, this drive is listed at $104.99, with free shipping too! This makes it one of the lower priced SSDs sold by Newegg. It pushes out the speeds (or very close to the speeds) that everyone wants. The last two months of use haven’t shown any BSOD or data loss issues, and for a price that fits into almost anyone’s budget. 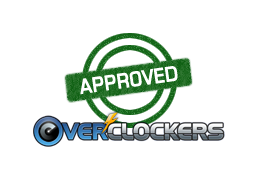 For these reasons, the Chronos gets “Approved”! I wish more people kept Mushkin in their systems. 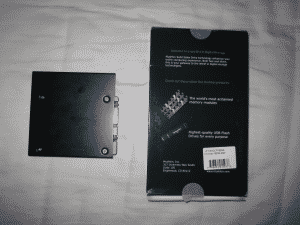 I have 2 of their SSDs and some SD cards. My first review! Hope y'all like it! And Archer, I love this thing. Cheap AND fast, can't beat that! Why would Asynchronous NAND slow down as it fills up? That is too in-depth of the workings for me to know/understand. Can anyone else give an explanation on why? This article at explains it pretty well. A few pages in to the article they fill the testing samples at 50% and show the decrease in performance. There is nothing in that article that shows that Asynchronous NAND slows down as it fills up. What they do show is that a SandForce based drive with Asynchronous NAND slows down more when it fills up than a SandForce based drive with Synchronous NAND. Going from that to thinking that Asynchronous NAND iself slows down is quite a leap. I would think it is more a reflection on the nature of the SandForce controller. I hear what you are saying, it would have been nice if they had run the same benchmarks again with the drives at 50% capacity..... then we could at least compare. as a abit of writing poor reviews. It shows very clearly that asynchronous slows down more than synchronous, but the slow down for synchronous is close enough to zero that its not perceptible to a human in most times where the slow for asynchronous is. 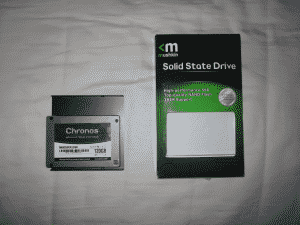 I had a 60GB version for my main system drive and a 120GB for games. I love the performance of these drives. Too bad the 60GB drive died after 100 days. Mushkins support has been silent for weeks after I inquired about the warranty which is supposed to cover it for 3 years. Review looks good for me! No idea about the (a)sync NAND differences. Just a thing I'd add (because we all like this kind of things) would be a picture of the innards. It's like n0rp for us enthusiasts, but I understand that you're not going to void the warranty of your Chronos! Been waiting for a SSD to pick up, I've been so on edge about it. Thanks for the review just picked up two. love my chronos it runs way better then my vertex3 did and 0 problems with it so far. Awesome dude! Post up how the RAID goes! I've actually heard that a decent amount. The issues with the V3 pushed me toward this one, and it was a good push. Well I have ADATA, OCZ and Mushkin. Funny thing is after I bought the first Mushkin I had to have another. I really do not know why though all I ever use them for is benching in raid 0:) Wicked fast but... useless on my main rig.